Asthma, cough, fever, body heat, rheumatism, abdominal pain, morbili, allergies, sprue, New wounds, sores ulcers, eczema, boils, stung by a centipede / bees, a poisonous snake bites, hair loss. 2 pieces of ripes tamarind bark, fennel as needed. How to make: two ingredients are boiled with 1 liter of water until boiling, then filtered. Drinks 2 times a day. 3 pods ripe tamarind, half handheld sage leaves. Boiled with 800 cc of water to boil until the remaining 200 cc. Filter. Drinks in the morning and afternoon. 3-5 tamarind seeds and cajuput oil sufficiently. Method: ripe tamarind seeds are finely ground. How to use: Clean the parts with a cloth moistened with eucalyptus oils. Then sprinkled / plastered with the potion tamarind seeds. Ingredients: 2 or 3 pods an old ripe tamarind, salt to taste, a quarter tablespoon of betel chalk. Method: Boil all ingredients in 3 cups water to boil (the remaining 2 cups),Filter. Drink 2 times a day, morning and afternoon. Ingredients: 1 handful of tamarind leaves, fennel as needed. Method: Both-materials are boiled in half a liter of water until boiling, then filtered. Material: A few tamarind seeds. Method: ripe tamarind seeds split into two parts. How to use: Hemisphere attached to the inside of the snake bite wound. number of seeds that are used as needed. Ingredients: 2 pods ripe tamarind, salt to taste. Method: Both materials are brewed with 1 cup hot water. Filter and drink as usual. Note: For pregnant women should not drink this recipe. 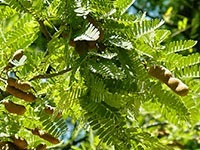 Ripe tamarind pods containing chemical compounds include: apple acid, citric acid, grape acid, tartaric acid, succinic acid, pectin and invert sugar. 74 milligrams of calcium per 100 grams, 113 milligrams of phosphorus per 100 gram, 0.6 milligrams of iron per 100 grams, 30 SI vitamin A per 100 grams, vitamin Bl 0.34 milligrams per 100 grams, 2 milligrams of vitamin C per 100 grams. Leather seeds contain phlobatannin and seeds contain albumnoid and starch.